Five Chinese Studies students and one Architecture student were proud winners at the 19th National Intervarsity Chinese Literature Award Presentation Ceremony held at the University of Malaya (UM) on 21 April 2017. 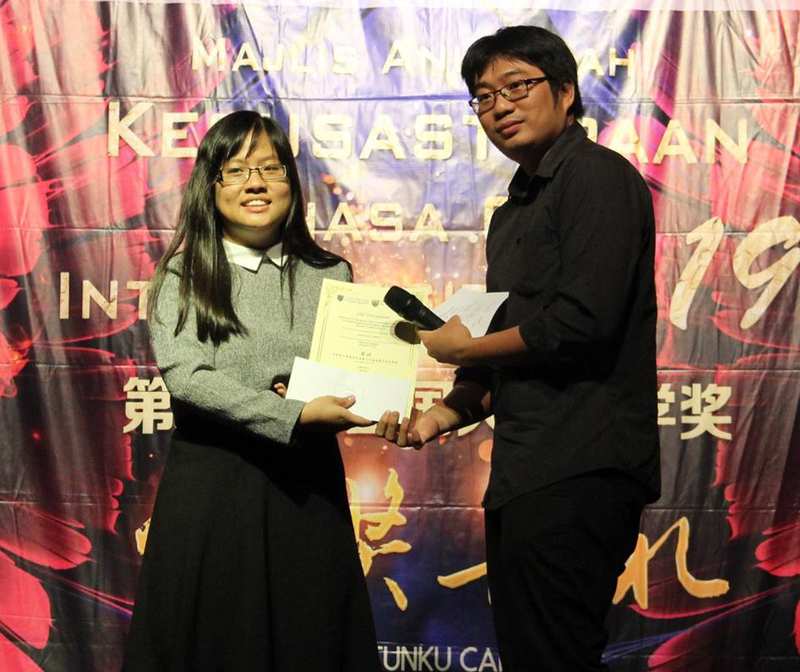 Hosted by the Chinese Language Society of UM, the event aimed to encourage university students all across Malaysia to engage in literary works. It also seeks to award recognition to the excellent examples of University students’ written literature. Chinese Studies student Pang Mei Jun won a double win at the competition. Her winning entries titled “The Idle Sunlight (《日色慢》)” and “Carousel (《旋转的木马》)” earned her First Prizes in the Prose and Novel categories. She walked away with two trophies, certificates and cash prizes totalling RM2,000. Her winning prose “The Idle Sunlight” is a story of a small town, descripted on the changes, lyrical and nostalgic of the town and people, from the rubber estate memories in the 1950s to 1960s until her secondary school memories in 1990s to 2000s. Meanwhile, “Carousel” is a story of a lady who has grown up under the patriarchal line, and her obsession with her body, gender and sexual desire. The writer further explores the relationship between women and her body and the relationship between gender barriers and patriarchal society. Another winner in Prose category, Chinese Studies student Lee Shu Yi with her winning entry titled “I Would Like to Talk to You (《我想和你聊聊》)” earned her a Judge Award. She walked away with a cash prize of RM600, a trophy and a certificate. Her winning prose described a scene that would take place when one meets a person that they really want to talk to, with various topics or ideas, but have nothing to say in the end, a kind of willy-nilly feeling. 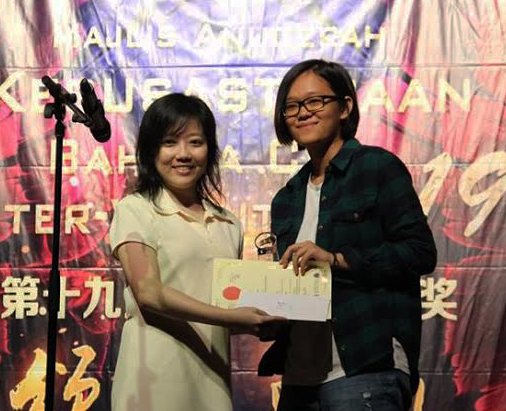 Another winner in the Novel category was Architecture student Goh Chin Chern with her winning entry titled “The New World Clauses (《新世录》)” earned her an Honorable Mention. She walked away with a cash prize of RM300 and a certificate. The background story of her winning novel mainly reflected on the dark side of what it seems like orderly social surface and the exploitation and repression of the marginalised groups. It also raised questions and doubts about happiness in the traditional utopian literature. 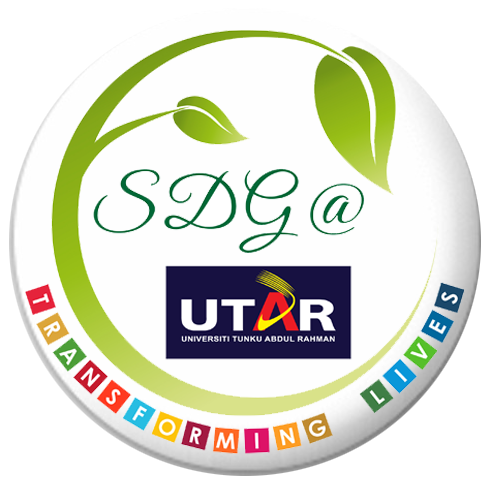 UTAR was the prodigious winner in the Modern Poetry category, which bagged one Judge Award and two Honorable Mentions. The Judge Award’s winner was Chinese Studies student Hoo Kiu Chew with his winning entry titled “Like (《喜欢》)”, and he walked away with a cash prize of RM600, a trophy and a certificate. Meanwhile, the Honorable Mention went to Ee Chin Huan and Chia Swee En with their winning entry titled “Learn to Write a Poem (《学诗》)” and “Forgive (《原谅》)” respectively. 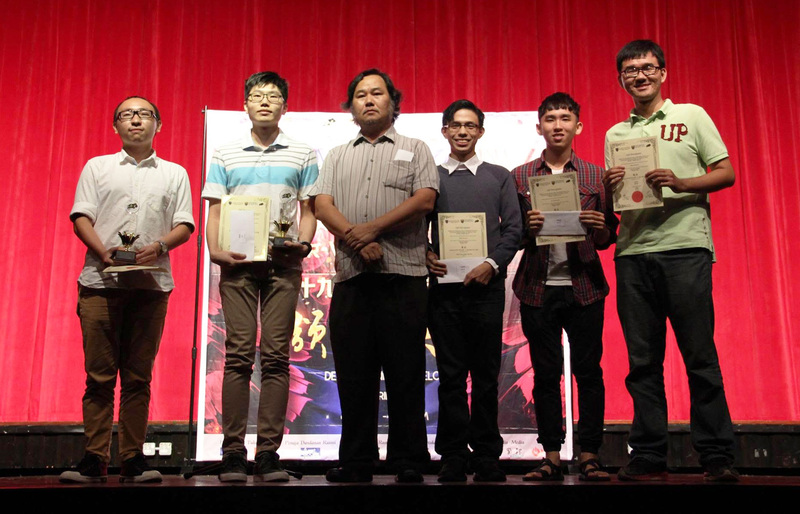 They walked away with cash prizes of RM300 and a certificate each. Hoo’s winning poem was a misty poetry regarding the growth process of a poet, which expressed about the thing that he likes will change along with his growth and the simple feelings that one experiences during the searching process, will touch the heartstrings of the reader. All the winning entries have been published in the literature collection “Wen Yi (《文毅》)” and it is available in major Chinese bookstores in Klang Valley.